You probably know the story by now. Sony, after the box office failure of The Amazing Spiderman 2, sent their webbed hero over to Marvel Studios, where he’s currently enjoying being part of the Avengers, stopping villains, and also “not feeling so good”. However, Sony still maintains the rights to both Spiderman and a wide array of other characters from his comics, including, as you may have guessed, his antagonist Venom, last seen in Spiderman 3 back in 2007. Cashing in on Spiderman’s profile as part of the MCU, they have commissioned a slate of films including other characters, such as Silver Sable or Morbius the Living Vampire, in order to create Sony’s version of the Marvel universe. As with other non-Marvel cinematic universes, this attempt has not gone well. 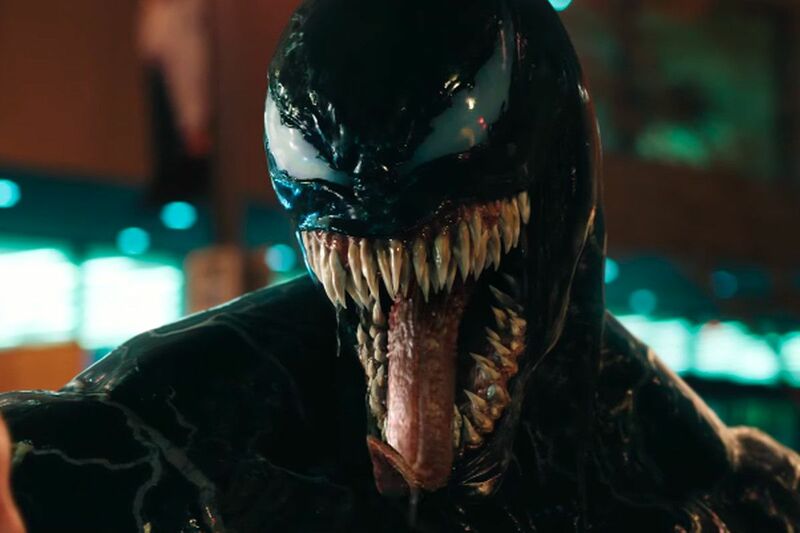 One theme that runs throughout Venom is that of the gene. And not just the technobabble about symbiosis, delivered through some of the most blatant exposition I have ever witnessed. It’s probably more prevalent as part of the first word I would use to describe it, GENEric. The film goes through and ticks all the standard superhero boxes. Dramatic opening? Check! Foreshadowing of future conflict? Present. Extended CGI fight scenes? Of course. The film spends a lot of time, particularly at the beginning, just plodding through the motions, aiming to make all the right noises in a not very convincing way. Once it gets past this, however, and Eddie begins to interact with Venom, a promise of what the film could’ve been rears its head. Arguably, this makes it worse, as it shows you something that it has no intention of delivering on. A potential exploration of the concepts of good, evil, and what really separates them via Eddie/Venom is not in the offing, and so after a pleasing middle third we return to a CGI smorgasbord. Another word I would use to describe Venom is shoddy. The film is peppered by characters and situations that are unbelievable. I’ll admit, as a dyed in the wool sci-fi fan that I often believe in Alice’s “impossible things before breakfast”. I’ll let the power of a lightning bolt send Marty McFly back in time, I’ll let Cooper communicate the secret of gravity to his daughter from inside a wormhole, because the films have built up enough goodwill to allow it. But this is not the case in Venom. Eddie Brock’s initial attempts at bringing down Carlton Drake are the epitome of bad journalism, despite him supposedly being “the best investigative journalist in town”. Carlton Drake himself is such an obvious, over the top facsimile of Elon Musk that there was no real need to change the name. The fact that a rocket launch site can be built just past the Golden Gate Bridge is just the cherry on the proverbial cake. There have been rumours of changes being made to the film, with Tom Hardy saying that “30 to 40 minutes’ worth” of his favourite footage was cut, though an executive producer, Matt Tolmach, has denied cuts to allow the film a PG-13 rating. Whatever the case, the film could definitely have done with a few more drafts before coming to the screen. As for the acting, this is probably the film’s strong suit. Both Tom Hardy (Eddie Brock/Venom) and Riz Ahmed (Carlton Drake/Riot), who have shown their skills elsewhere, persevere with some ridiculous lines, which sound as if they were placeholders for replacements that never arrived. It’s also a bit of a mystery why Michelle Williams (Anne Weying) features in the top billing-she certainly does her best, but with so few appearances it’s difficult to make her character anything other than ‘the love interest’. Arguably Jenny Slate should’ve got higher billing, with her character of Dr Dora Skirth giving much more to the plot, and being a far more interesting character, than Weying. In all, I would describe Venom as a film with moments. Occasionally, when Eddie and Venom interact, there are flashes of a film that could be anything from body horror, exploration of the human condition, or dark comedy. These are normally quickly deluged by a tide of nonsense. All I can say is, I’m quite glad that when I went to see Venom it was with two for one tickets.